It is a truth universally acknowledged, that an obstetrician in possession of a scalpel must be in want of a holistic midwife to teach them woman-centred ways. 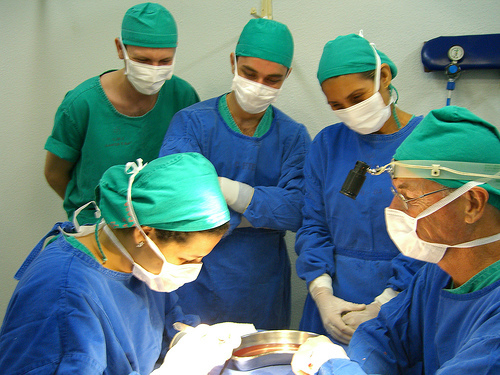 However little known the feelings or views of such an obstetrician may be on his or her first entering practice, this truth is so well fixed in the minds of the surrounding midwives, that s/he is considered as the rightful recipient of some – if not many – of their woman-centred values, primum non nocere viewpoint and ways of seeing birth as a normal, everyday event. Unless this is your first visit to this website – in which case, welcome – you’re probably aware that I often talk and write about the existence of two different paradigms (or sets of ideas) that exist in relation to maternity care. They’re often called ‘the obstetric approach’ and ‘the midwifery model’, although I try never to mention them by these names without immediately adding the caveat that the names of these approaches relate to belief systems, not to people or professional groups – so there are plenty of obstetricians who take a midwifery model approach, just as there are a good many midwives who are more closely aligned to the obstetric viewpoint. If you’re not already familiar with the differences between these models, this brief article explains them a bit further. Many women value and want the ‘midwifery model approach’, which is more inclusive of their knowledge and experience and sees pregnancy as a personal and usually healthy journey. The midwifery model approach is also supported by tons of evidence that it brings many benefits for women and babies. It places the woman firmly at the centre of her care and acknowledges her as the key decision-maker. It doesn’t reject technology and intervention where this is appropriate and the woman is happy to have it, but it is often respectful of non-Western approaches, ideas and therapies as well. There are variations between different countries and areas, of course, and many midwives, doctors and others are already respectful and supportive of an evidence-based, woman-centred approach and see enormous value in a model where midwives are the primary caregivers for women, with obstetricians being invited (if a woman wants this) to consult in situations which are not quite so normal or straightforward. There exists mutual respect between the two groups, with obstetricians being respectful of midwives’ knowledge, of their ability to determine when things are fine and normal and when a bit of help (of whatever kind) might be needed. Midwives in such settings are equally respectful of the obstetrician’s experience in dealing with less straightforward situations and of their surgical and medical skills which are sometimes the best pathway to a good outcome. Because I have quite a lot to say on this topic, I’m dividing this piece into two parts. In this first part, I am going to suggest that the first step is about understanding why people think, believe and do what they do, and then in the second part of this article I will look at how and why people come to reconsider and change their approach, and what we can do if we want to help facilitate reflection and change. Understanding where medical-model focused people are coming from … and how they got there. I don’t mean to suggest that everyone has been on the same journey – far from it – so this needs to be individualised, but there are some key elements of our culture in general and of medical (and sometimes midwifery) education in particular which predispose people to taking a medicalised, doctor-centred approach to birth. If you’re reading this as someone who has been part of ‘the birth world’ for quite some time, it is easy to lose track of how birth is viewed and portrayed outside of such networks. Turn on daytime TV for even just a few minutes (but only if you think you can handle it – I did just that the other day when I was unwell – big mistake!) and you’ll encounter all sorts of fear-based views about birth which are often in complete opposition to what we know from the evidence. So many people are affected by the mainstream Western cultural viewpoint – which includes the notion that birth is risky – before they even go into medical or midwifery education, so it is unsurprising that this notion carries on as a core element of many people’s belief systems. The educational journeys of midwives, doulas and childbirth educators often include significant opportunity to unpack one’s own pre-existing cultural biases, reflect on situations experienced in practice and ponder a wide variety of ideas and approaches, but (with the caveat that some innovative and exceptional courses are beginning to be offered by some medical schools) this is not generally the case in medical education. The process of medical education itself may also have a significant part to play in informing the belief systems and priorities of practitioners. I don’t really need to write much about this – although it is a huge issue – because Robbie Davis-Floyd wrote a really interesting paper called ‘Obstetric Training as a Rite of Passage‘, in which she analysed the words and experiences of obstetricians, showing how the very nature of medical education has an effect on the way in which they thought about and saw the world. If you’re interested in this question and not already familiar with this work, I thoroughly recommend you go off and read that paper in full, because it can really help to illustrate why people who go through different kinds of educational processes end up with different kinds of belief systems. Then, we need to look at the expectations that people have of doctors (and other professionals) these days, which are often – perhaps partly because of the erroneous ideas perpetuated by modern culture and the mass media – unrealistic. There are no guarantees, and yet that is exactly what some people want and expect doctors to provide. People who specialise in the abnormal are only ever really going to see that, and so it becomes harder and harder to remember that normal really does exist, which explains why some people have such a hard time trusting women’s bodies, taking a woman-centred approach or feeling able to wait. In addition, some people don’t want to make their own health-care decisions (although of course many do) and the weight of expectation (and let’s not forget litigation) that some professionals feel can create immense pressure to perform and an almost unbearable sense of responsibility. Add in the pressure placed upon people by the systems of care, budgets and other frameworks within which many are working, and I think it becomes easier to understand why some people end up taking an approach that seemingly ignores the individual and prioritises routine intervention over a woman-centred approach.